Hey, folks! It is Valentine's Day today, which means its the perfect occasion to express your love for your partner. Well, that's exactly what Bollywood celebrities are doing on social media. It wouldn't be wrong to say that the social media is currently bombarded with Valentine's Day posts but we are not complaining. Stars like Akshay Kumar, Anushka Sharma, Ritiesh Deshmukh, Arjun Rampal and Preity Zinta have shared recent pictures with their partners. Other Bollywood celebrities such as Sonam Kapoor and Shilpa Shetty, who won't be able to spend the day with their partners, shared adorable throwback pictures on their respective Instagram profiles. 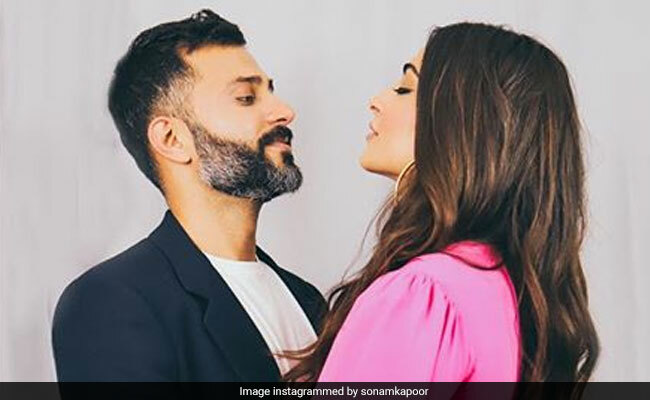 Sonam Kapoor's Valentine's Day special posts were not only confined to her husband Anand Ahuja. The Neerja actress shared a series of posts for her friends Masaba Gupta and Pooja Dhingra, her sister Rhea Kapoor and others. In her post for husband Anand Ahuja, Sonam wrote: "Happy Valentine's Day my love... I miss you and I'll see you soon. Every day phenomenal." Happy Valentine's Day to my soulmates ... we will always have each other. #galentinesday #valentinesday #broseff @samyuktanair @shehlaa_k @rheakapoor @karishma ! @aartishetty is missing here.. but love you the same. Star couples such as Anushka Sharma-Virat Kohli and Akshay Kumar and Twinkle Khanna also shared loved-up posts on social media. Another lovely Valentine's Day post came from Riteish Deshmukh, who shared a picture of himself along with his wife Genelia D'Souza. Riteish accompanied the post along with a simple and sweet message that read, "Life without love is a life not lived. Happy Valentine's Day." Angad Bedi, who married Neha Dhupia in May last year, shared a mushy post and wrote: "Valentine's Day my love. You are my world and my strength. May we walk many miles together .Through good times and tough times. May we laugh and celebrate each day. I will always love you." Arjun Rampal's Valentine's Day greeting featured his girlfriend Gabriella Demetriades. "Spread the love. Happy Valentine's Day to all," Arjun captioned the post. Shilpa Shetty might not celebrate Valentine's Day with her husband Raj Kundra this year but that did not stop the actress from sharing a super cute boomerang. "My valentine. Always and forever. Miss you. Our first Valentine's Day apart. Can't wait to celebrate. Every day with you," Shilpa captioned the video. Romantic pictures were just one aspect of Valentine's Day celebrations, some celebrities shared unconventional Valentine's Day posts and we assure you that some of the pictures will definitely make you go aww. Sonakshi Sinha's Valentine's Day post featured her pet dog Gabru. She wrote: "Happy Valentine's Day... from us to you! Meet my new baby Gabru." Kartik Aaryan shared a cheeky post on his Instagram profile. The actor shared a picture of himself along with a skeleton, which he referred to as his "Date" in his caption. Kartik wrote: "Happy Valentine's Day from me and my date. Sonu, Gogo and Rajjo play karne ke baad who else would go on a date with me." How are you celebrating Valentine's Day this year? Tell us in the comments section.